The LightWorks Plug-in for TurboCAD Deluxe enhances the program’s lighting, luminance, and photorealistic rendering capabilities for more robust, high powered renders. This plug-in integrates directly with the TurboCAD material editor and Desgin Director. Appropriate for TurboCAD Deluxe 2015 and 2016 owners. TurboCAD Deluxe 2016 includes a powerful rendering engine for quick and easy presentations of your design. For customers looking for more rendering options, the LightWorks Plug-in for TurboCAD 2016 enhances the program’s photorealistic rendering capabilities with more robust, high power rendering. 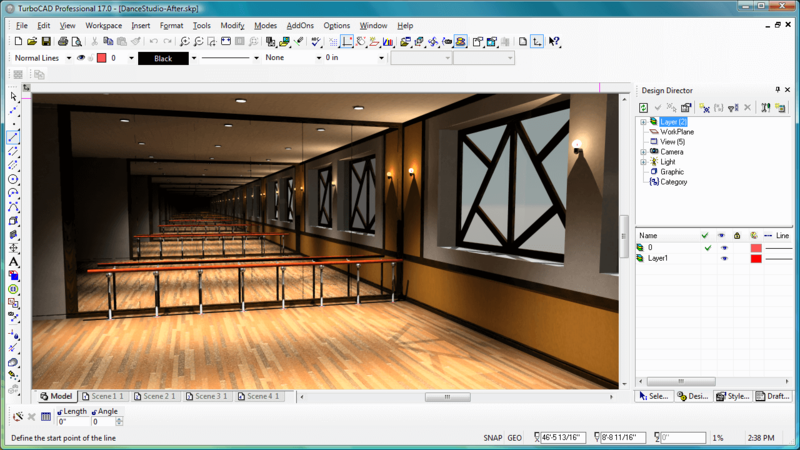 The LightWorks Plug-in for TurboCAD Deluxe 2016 also offers robust support for lighting and luminances. Lights are OpenGL based, are quick to add and use, but are more limited in their options than Luminances (see below). Lights may be added with a click, and their properties adjusted in the Design Director, which also enables creating light sets that can be turned on or off as a group. Directional Light — has an origin and a direction, providing an infinite light that does not fade with distance. Headlight — provides a Directional Light sourced at the camera source sot that it is always illuminating from the user's vantage point. Point — provides light equally from all directions. Spot Light — provides a directional light eminating from a point and projecting in a cone. Each light has many different properties that can be managed, including the color; intensity; fall-off; shadow softness; and more. Some that are directional specific may include properties such as the beam sharpness, penubra and umbra (the angle of the cone of light and the darkness in the center of the beam, useful for flashlights). Luminances include advanced lighting properties that can be assigned to the whole model, or to specific objects within the model. Any number of lights may be combined, so that an Ambient luminance may be used, then augmented by other lights and luminances. Ambient – Illuminates all surfaces equally, regardless of orientation. Area – Simulates a luminous surface. Area Goniometric – Combines both area light and goniometric properties. Area Sky – Limited Sky light covering the light that passes through portals such as a window or door. Distant – Illuminates consistently, is directional and parallel. Eye — sourced at the view point. Goniometric — directed light defined by an .ies file (a text-based file) often provided by lighting manufacturers for their bulbs or fixtures. Point — emanates from a single point in all directions. Projector — projects a graphic image onto a solid object based on a raster image file, and which is often combined with environmental dust or fog to catch the beam as at the cinema. Simple Environment — lights a scene based on an environmental map such as an HDR image, or even a .jpg or .png file. Simple Sky — lights the model based on a uniformly bright hemispherical dome. Sky — light that simulates a sky light providing soft and natural shadows and is modeled as a hemisphere of infinite radious and positioned above the center of the model. Spot — provides directional light that is constrained to a cone. With each light and luminance there are numerous properties. Combine them effectively and the possibilities are endless. Create natural lighting for various conditions, artificial lighting to simulate any environment necessary, or mood lighting to emphasize elements of a design and provide an impact. Lighting is a very powerful element in the design communication process. 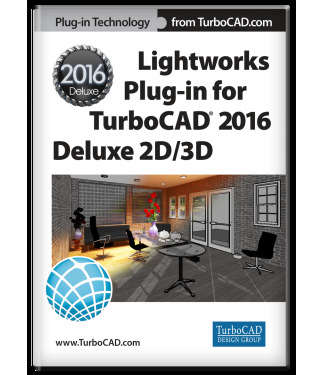 The LightWorks Plug-in for TurboCAD Deluxe 2016 integrates directly with TurboCAD’s material editor. It also provides numerous shaders to create materials and their finishes with a real-time preview. This is available even on a selection from the model instead of just a simple cube or sphere (also available). When creating or altering materials, there are extensive descriptions of each shader in the dialog window to simplify each step. There are over 500 materials included, with the ability to create hundreds custom Colors, Materials, and Effects to extend your rendering capabilities. Some LightWorks materials are bitmap based textures, others are procedural materials, which means that the pattern is calculated so that it does not repeat in a tiling manner. Bitmap textures may be brought into TurboCAD and used as material textures, including support for objects with alpha channel transparency. This can be useful for entourage, or landscaping and a 2D image of a tree can render much faster than a high-polygon 3D modeled tree with each leaf being calculated separately.